Chairman of UEL, Mr. Kox urged to protect Council of Europe standards and values while fighting international terrorism, two elements which should go hand in hand. 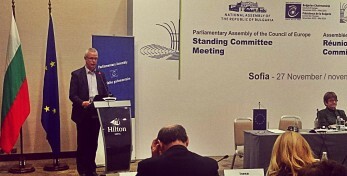 At the meeting of the Standing Committee in Sofia during the debate initiated by UEL Chairman, Mr. Kox urged to protect human rights and European standards and values while fighting international terrorism, a major threat to civilization. “While looking for the best ways to combat terrorism, we, parliamentarians, always have to be the guarantee that all what we propose and adopt is indeed human rights proofing and compliant and remain within the rule of law”, said Mr. Kox. UEL Chairman stated that in times where European values, standards and principles are under serious threat we have to stand even stronger in our commitment to protect them. The speech resonated with the mood of members of PACE who proposed that action on the highest level is needed to tackle this major threat and reiterated that it is important to pose fundamental questions in order to be using the correct instruments. Mr. Kox warned that one should be careful in the too easy framing and naming of the fight against international terrorism as a “war” as “none of the international conventions we drafted to combat terrorism do define those who commit terrorist acts as a soldiers of an army with which we are at war but as criminals who commit awful crimes against innocent people in order to destabilize our societies and create an atmosphere of fear”. The vocabulary can bring far reaching and undesirable implications. The debate in Sofia concluded with the decision to hold an urgent debate during the first part session of PACE wich will be held from 25 – 29 January 2016.